We love lasagna in our home, but for some reason I don’t make it that often. Lasagna maybe makes my meal plan once every two months. And if it does it’s my one pot meat lasagna version. Rarely ever is it actually a tray of lasagna. A few months ago, one of my good friends had her third baby. I wanted to come visit but I also wanted to bring a few meals over. She is a vegetarian and her family is not. 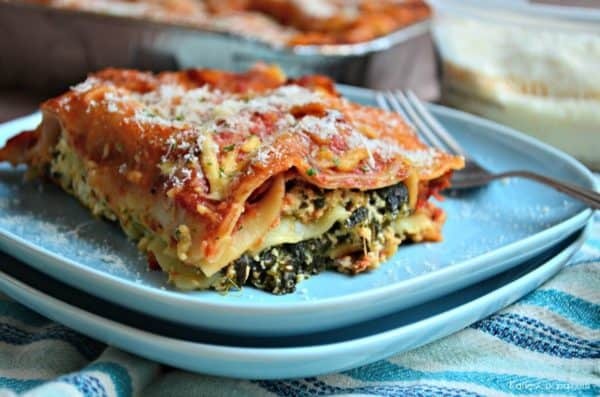 So in an effort to please everyone one of the dishes I brought over was a small tray of this spinach and cheese lasagna! I first published this recipe back in 2010 so I feel like it’s time to revive it and share it again with the world. I’ve made this recipe countless times. I first learned how to make this recipe when I was in 7th grade economics. That my date me right there, but I’ll tell you that I went to a junior high that still offered this. I wish all middle school and high schools still offered home-ec. Kids need those skills these days! Anyways getting back to the spinach and cheese lasagna. I remember our home economics teacher telling us how easy this recipe is to make and how this is a great way to sneak spinach into meals without kids knowing. Remember she was talking to kids! 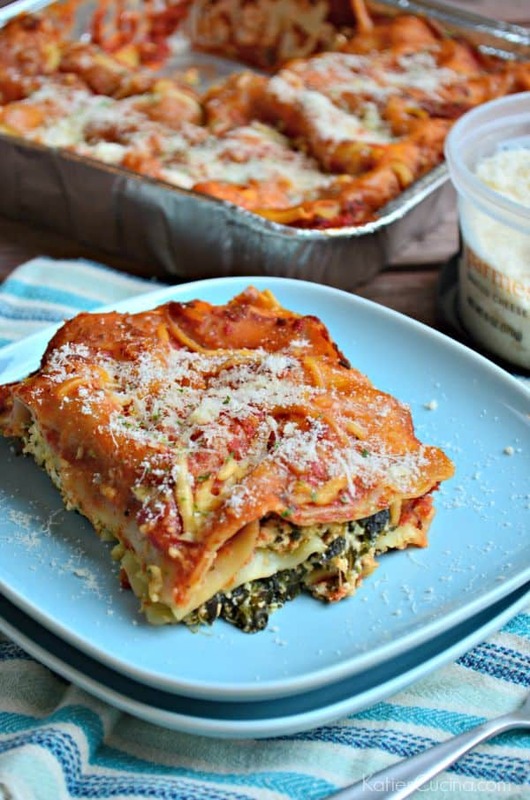 But I agree with her–everyone I make this for has no clue it’s chocked full of spinach! I made two small 8×8 pans of the spinach and cheese lasagna the night before I was going to bring my friend a few meals. I saved one pan for my family so that the next day all I needed to do was pop it in the oven and it was done! It was delicious and I was happy I made the lasagna the night before. I did it after my son went to bed so the prep went quickly and even better no need to pre cook anything! 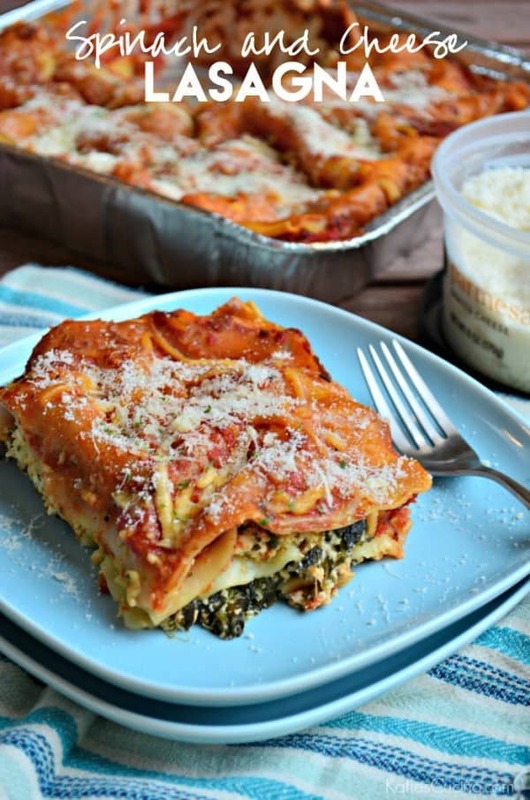 If your looking for a delicious lasagna recipe for your family or maybe to make for a friend this is the recipe for you! In a large bowl, combine a beaten egg, ricotta cheese, 2 cups of mozzarella, 1/2 cup of Parmesan cheese, minced onion, minced garlic, thawed spinach, and Italian seasoning. Mix together well until all the ingredients are well incorporated. In one 9 x 11 pan or two 8x8 pans spread 1/2 cup of sauce on the bottom of the pan. Layer in the order of 2 uncooked lasagne noodles, 1/3 part of the ricotta mixture, 1/2 cup of mozzarella cheese, 1/2 cup sauce, and then repeat two more times. Top the last noodle with the remainder of the sauce followed by mozzarella and parmesan cheese. Bake covered with foil for 20 minutes. Take the foil off and place back in the oven for an additional 5 minutes to brown and crisp the cheese. A tip for thawing spinach. Microwave then drain. Place the spinach on a thick stack of paper towels or cheese cloth and ring out the spinach. You won’t think there is any more liquids left but spinach holds tons of liquid! You want this spinach to be super, super dry!